Dark chocolate and blueberries are a great dessert pairing. When used in a tart recipe along with your favorite porter beer, the end result is a decadent sweet treat with a lot to offer. Fruit desserts with chocolate work so well because fruit and chocolate balance and complement each other. Deep complex flavors enhanced with fruit is the secret to a good tart recipe. With Labor Day weekend coming up, why not celebrate with a batch of dark chocolate blueberry tarts? Here’s how to make these mini chocolate and fruit desserts. Make the dough 2-3 hours in advance. 1. Add flour, butter and sugar into a food processor. Process until crumbly. 2. Whisk egg yolks with the ice water in a medium bowl. 3. Run the food processor as you slowly add the egg and water mix. 4. Transfer the dough to a piece of plastic wrap, form into a ball, wrap and refrigerate for 2-3 hours. 5. Pour beer and heavy cream into a saucepan. 6. Heat over medium low. 7. Bring to a low simmer. 8. Add chopped chocolate and butter into a heat safe bowl. 9. Pour the heavy cream and porter mix over the dark chocolate and butter. 10. Allow the hot liquid to melt the butter and chocolate for a few minutes before adding the sugar and salt. 11. Whisk and set aside. 12. Preheat oven to 350 degrees F.
13. Coat tart pans with cooking spray. 14. Press about 2 tablespoons of dough into each mini pan (be sure to press up the sides as well). 15. Use a knife to remove excess dough and bake for 12-15 minutes or until golden. 16. Cool and turn out the tart shells. 17. 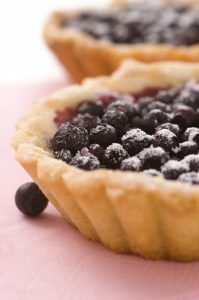 Fill each shell with the tart filling, arrange fresh blueberries on top and chill for 3-4 hours to set. This tart recipe is extremely simple and very delicious. These dark chocolate and fruit desserts are ultra-decadent and the addition of porter beer elevates them to new heights. Serve these at a party and everyone will be asking for the recipe.